Stuffed bottle gourd recipe or bharwan lauki Recipe is inspired by cuisines of Nawab. This recipe is also know as lauki dum banarsi recipe. Lauki is also known as Bottle gourd and has numerous health benefits. There are many benefits of bottle gourd. Bottle gourd is rich in dietary fiber and not loved by many. Bottle gourd juice is also helpful in losing weight. I am dedicating this recipe to all mothers whose children hate green vegetables. There are many Indian bottle gourd recipes like Ghiya/lauki kofte. We will teach you how to make stuffed bottle guard (Bharwa lauki) and we all know everyone loves stuffed vegetables. So let’s start. Wash and peel 2-3 potatoes. Grate them and squeeze them to remove moisture. Wash and peel the bottle guard and cut it into 3-4 pieces and make hollow from inside. Take a pan and add 1 tbsp oil and add 1 tsp cumin seeds, 1/2 tsp fennel seeds, 1/4 tsp asafoetida to it. Add finely chopped onions to the pan and stir it. Add 1/2 tsp of turmeric powder, 1 tsp red chili powder, 2 tsp coriander powder, salt (to taste), 1/2 tsp of dry mango powder (amchur) and now mix it. Add grated potatoes and bottle guard’s pulp and mix it. Stuffing is ready now. Let it cool. Fill the mixture/stuffing into hollowed bottle guard. Take a pan and add 2 tbsp oil to it. Add 1 tsp cumin seeds, 1 tsp fennel seeds and 1/4 tsp asafoetida. Add stuffed bottle guard and simmer it for 15-20 minutes on medium flame. Add leftover stuffing to the pan. When bottle guard get tender, sprinkle 1/2 tsp of dry mango powder and fenugreek leaves on it. Garnish it with finely chopped coriander leaves and serve hot. Preparation : Take 2-3 potatoes and wash them. Peel them and grate them. Squeeze them as much as possible to remove the moisture. And keep dry grated potatoes aside until required. Chop onions finely and keep it aside. Take a bottle guard of 1/2 kg and wash it. Peel it and cut it into 3-4 pieces. Now carefully hollow them form the center with the help of peeler and scoop out the inside pulp. Keep the pulp on the plate. Prepare Stuff for Filling : Take a pan and add oil/clarified butter to it and heat it. Add 1 tsp of cumin seeds, 1/2 tsp of fennel seeds (Saunf), 1/4 of asafoetida. Mix them and allow them to sizzle. Add finely chopped onions to the pan and stir it. Simmer it until onion turns golden brown in color or turns transparent. After that add 1/2 tsp of turmeric powder, 1 tsp of red chili powder, 2 tsp of coriander powder, salt (to taste), 1/2 tsp of dry mango powder (amchur) and now mix them thoroughly. Simmer it for 5-6 minutes. Now add grated potatoes and again simmer it till potatoes get tender on medium flame. Add bottle guard’s pulp to the pan and mix it well. Simmer it for 4-5 minutes. Stuffing is ready now, turn off the stove and take out the stuffing on the plate. And let it cool. Fill The Stuff in bottle guard : Now our pulp mixture/stuffing is ready. Fill the mixture/stuffing into hollowed bottle guard one by one gently. Keep it aside until required. Cook the bottle guard : Take a pan and add 2 tbsp oil/clarified butter to it. Heat it and add 1 tsp of cumin seeds, 1 tsp of fennel seeds (saunf) and 1/4 tsp asafoetida (hing) and allow them to sizzle. Add stuffed bottle guard to the pan and simmer it for 15-20 minutes on medium flame. Add leftover mixture to the pan and add finely chopped coriander leaves. Mix them. You can also make stuffed bottle guard in microwave if you are health conscious. When it cooked from one side, toss it and cook it from another side. Add 1/2 cup of water if needed. When bottle guard get tender, sprinkle 1/2 tsp of dry mango powder/ amchur on it. Take (Dried Kasoori Methi) fenugreek leaves and rub it on hand and spread it on the bottle guard. When it cooked from all the side take out the stuffed bottle guard from the pan. Turn off the stove. 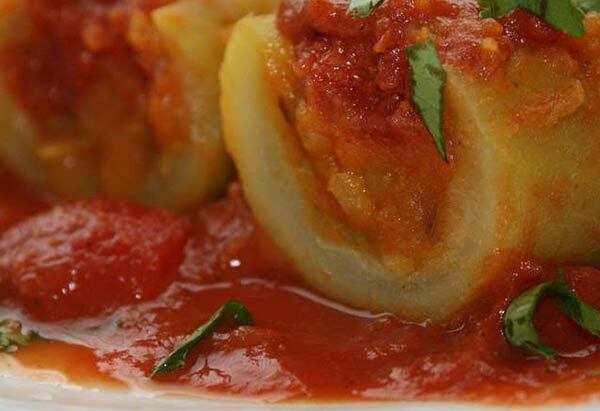 Enjoy this Indian Classic Bharwa dish – Bharwa Lauki (stuffed bottle guard). Add peas if you want.